An early-morning Instagram post on Jimmy Garoppolo's verified account saying farewell to New England sent social media buzzing Friday, but the Patriots quarterback's agent said that his client's account was hacked. "Jimmy's social media account was hacked," agent Don Yee told ESPN's Mike Reiss. When asked about a potential trade involving Garoppolo, a source close to the quarterback responded to Reiss, "not to my knowledge." As of 9:25 a.m. ET, the post, which read "So grateful for my time in New England. Peace out Boston" has been deleted. The post went up at roughly 4 a.m. ET. Sources have told ESPN's Adam Schefter the Patriots intend to keep Garappolo for 2017 and possibly beyond with Tom Brady turning 40 this summer. There are "no trade talks" involving Garoppolo and the Cleveland Browns at this time, sources told ESPN's Josina Anderson. The ongoing Jimmy Garoppolo saga took an interesting turn at around 5 a.m. Eastern time Friday morning, when a post briefly appeared on Garoppolo’s official Instagram account. 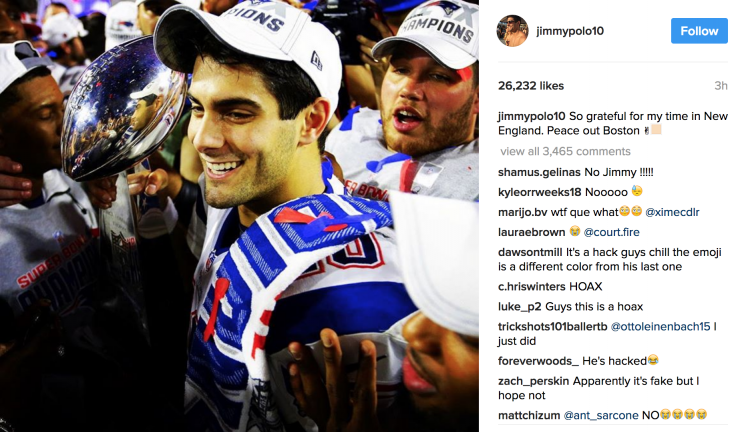 0 Response to "Post on Jimmy Garoppolo's Instagram sets off frenzy"